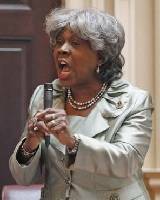 In response to a recent Quinnipiac poll showing Virginia voters split 44% to 44% between presidential candidates Barack Obama and Mitt Romney, Democratic State Senator L. Louise Lucas is claiming that Gov. Romney is appealing to racists who do not want to see anyone other than a white man in the oval office. She realized people would cringe when hearing this, but said that it's because they don't want to hear the truth. “I absolutely believe it’s all about race, and for the first time in my life I’ve been able to convince my children, finally, that racism is alive and well."